Side and rear glass removed and refitted, or supplied and fitted. Genuine, second-hand, or aftermarket auto glass meeting OEM equivalent quality, can be sourced. 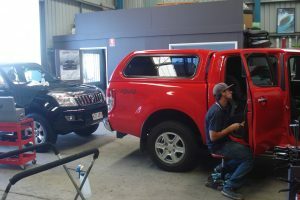 For the RV, Bus, Truck and Heavy Machinery, there is easy main or side road entry to a large, high access workshop area. Insurance claims for side and rear auto glass replacement can be organized and processed on our customer’s behalf. Toughened glass is most frequently used in the rear and side windows of vehicles. It is designed to be much stronger than standard glass. In the case of breakage, it shatters into very small blunt pieces thereby significantly reducing risk of injury. To produce a tempered glass for automobiles, glass is heated until its temperature gets near the softening point and then cooled quickly to get the surface of glass to produce prestress layer on the surface of glass and produce tensile stress inside it, so as to improve the strength of glass. The heating cycle is also used to shape or curve the glass, either by allowing the heated glass to ‘sag’ to a pre-defined mould shape under gravity, or for more complex shapes, by being pressed to shape by male and female moulds. SAFETY – If the tempered auto glass gets broken, the whole glass is torn into obtuse particles shaped like honeycomb which are less harmful to the human body. Thus, the personal safety of the driver and passengers can be well protected. HIGH MECHANICAL STRENGTH – The impact resistance of temper glass is five to eight times more than an annealed glass of the same thickness, as well as three to four times higher resistance to weight. THERMAL STABILITY – The glass can endure temperatures ranging from 250*C to 350*C. Our specialist manufacturers can produce temper glass to your specifications in special circumstances. COLOUR TINT – Is also available in the manufacturing process know as Clear, Green, Bronze or Blue. 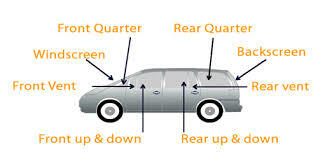 FEATURES – Some vehicles may require Solar absorbing, Acoustic or Heater demist glass. Low visible Compliance Mark for vintage and collectable cars.